iBrickr by cre.ations.net is a tool offering options for users to transfer data from iPhone to a computer. 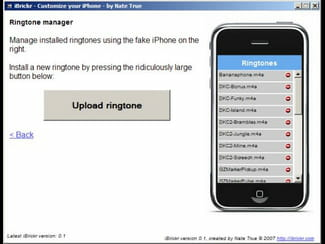 It is possible to modify iPhone, add, manage and custom ringtones in a matter of seconds. This a softwarecan transfer ringtones, logos and other data from iPhone to the user's HDD. Seen the intuitive interface, this action will be easy to perform. In addition, iBrickr is also capable of installing applications and games to iPhones. As told above, this program is easy to use thanks to its intuitive interface. All users need to do is to launch the application and connect to iPhone. Moreover, a file guide has been integrated to play the role of an automatic assistant helping in transferring data and installing applications. With iBrickr, users can fully control data. For instance, users can easily modify some parameters such as ringtones, volume, sound, etc. Adding and managing ringtones can be done in a matter of seconds thanks to the use of this application. To start with, users just have to run its executable file and viola. iBrickr can be used free of charge. It is a must for iPhone users. Latest update on February 3, 2015 at 11:18 AM.